no, I don't but would be interested in purchasing one. I like stuff like that. Is there a "best place" to get one? I usually look for things on Amazon.com first, but is this something that is more specialized and would need to be purchased elsewhwere? 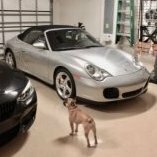 edit: I found this: http://www.amazon.com/Porsche-PIWIS-Engine-Diagnostics-Lights/dp/B006UJ0BMM/ref=sr_1_1?ie=UTF8&qid=1328279728&sr=8-1 $40 from amazon.com. is this reasonable or is there something better? I tried clicking my key remote button (the lock / unlock) button twice and then turning the key on in the ignition. It didn't fix the problem. Am I doing it wrong? Any other suggestions? Okay, I'll give it a try. by "double clicking the alarm" I'm going to guess that means pressing the key lock / unlock button twice. thanks Loren and JFP. the one that normally flashes when the alarm is set. right in the middle of the dashboard, on the top where the dash meets the glass, right in the middle of the car (side to side). I would probably get a new one, next year or the year after. why so little Panamera discussion? too new of a car? So expensive that no one works on it themselves? I'm considering purchasing one and would like to hear people discussing them and their concerns / problems. Maybe there arent any problems (just kidding).